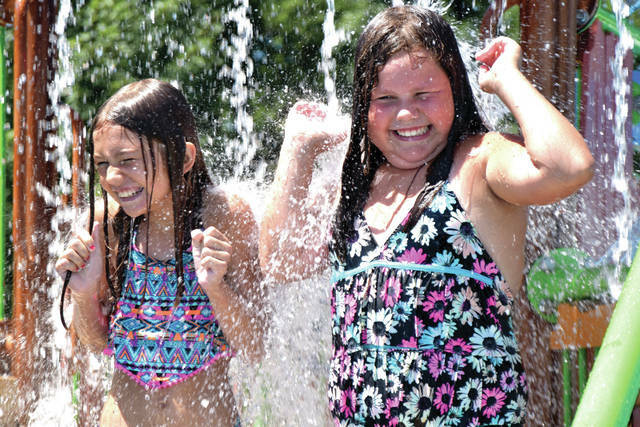 Cody Willoughby | AIM Media Midwest file photo Maya and Natalie King, 9 and 11, of Troy, cooled off under the waterfall at Tippecanoe Family Aquatic Center this summer. TIPP CITY — A hot summer meant good attendance at the Tippecanoe Family Aquatic Center this season. City council heard an update from Finance Director John Green at a recent work session, whose report showed the highest average daily attendance at the pool in several years, up about 5,000 attendees from 2017. “We had a fantastic June, an almost fantastic July. We were running at, revenue-wise, the highest levels we’ve had in five, six seven years,” Green said. There were 15 days where temperatures reached 90F or above, although cooler weather affected attendance later in July and in August. The center finished the season with a positive balance, although several pool repairs and improvements brought that total to $369. “We did end the year positive, not by very much. But it was positive even though we did have a lot of maintenance expenses. The last three years, we’ve ended on a positive note each year,” Green said. Total revenue, $336,893, was up from 2017’s totals, $312,062. Operating costs were also higher this season, which included maintenance expenses. The center needed $15,000 in HVAC repairs and improvements, pool painting at a cost of $6,600, and a handicapped entry chair, which was partially paid for by the city’s CIP fund. There are more improvements ahead in 2019, including the installation of a new play structure. A couple of pumps that need to be rebuilt, but Green noted that they will be paid for out of the capital improvement fund. “We’re not anticipating those maintenance items having to be done out of the pool fund in 2019,” he said. Pass sales were also up this year, which Green credited to the adjustment in prices made last year. Resident family pass sales increased from 258 to 273. Last fall, council voted to eliminate the non-resident taxpayer category and combine it with the non-resident category, while also lowering the season pass rates for non-residents. Season pass rates for non-residents were reduced by $15 to $165 for adults, $135 for youth and seniors, and $275 for families. This year, the number of non-resident family passes sold increased from 94 to 165. Daily rates have not changed since 2009 and Green said he sees no need to increase them. This year was also the final year of the center’s contract with Dayton Pool Management and the city plans to put that contract out to bid this fall, Green said. The city has paid them a fixed rate of $228,750 for the last three years. https://www.weeklyrecordherald.com/wp-content/uploads/sites/51/2018/10/web1_TippPool3.jpgCody Willoughby | AIM Media Midwest file photo Maya and Natalie King, 9 and 11, of Troy, cooled off under the waterfall at Tippecanoe Family Aquatic Center this summer.